Guest post by Heidi, who had way too much fun coming up with these recipe titles! You’ll appreciate these someday when the grid is down and zombies are walking up your front sidewalk! 3. Quick! Cook All the Freezer Meat Stew! **Skip the frying pan and put some oil in your dish and lay the Crab cakes in it. Then put in Solar Cooker until hot and heated or spread in a dish and use as a dip. 6. Did Grandma REALLY Eat Chicken Foot Soup? **Substite the beef with TVP if desired. 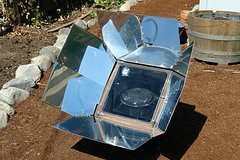 where can i find a solar oven like the one in the picture shown above posted by your recipes? it,s so hot here in texas during the summer i would like to get one for my wife to cook with so we don,t have to heat up the kitchen and run another air conditoner just to eat indoors….. thanx. Great post. A little worried about moving back to Oklahoma after all these storms lately. I know what you mean! There are a number of job openings in Tulsa in my husband’s field and I’m with you. Not sure I’d be excited to move there. This list was compiled a little while ago. They must have removed the Chicken Foot Soup recipe. Please substitute the word “substite in #10 (TVP) for “substitute”. Thanks.